Bovada esports Betting Review - 50% WELCOME BONUS ! 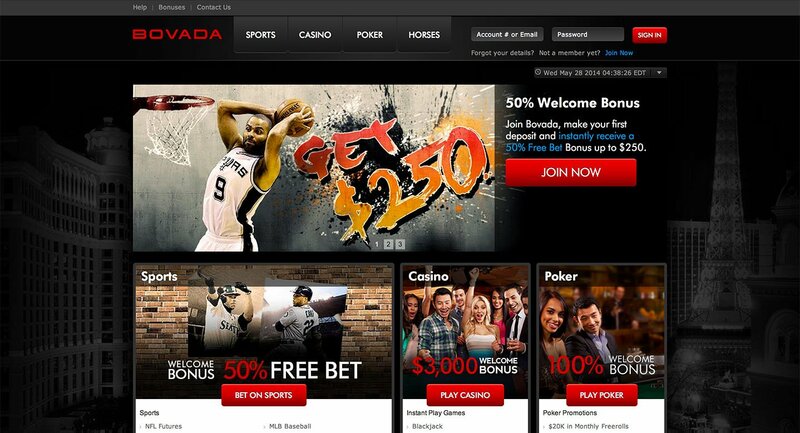 Bovada eSports is a leader in the betting industry with a newly redesigned looks. Want to know the available games, payment options, and bonuses? At the end of this review, you will have figured out if it’s the ideal site for your eSports betting needs. 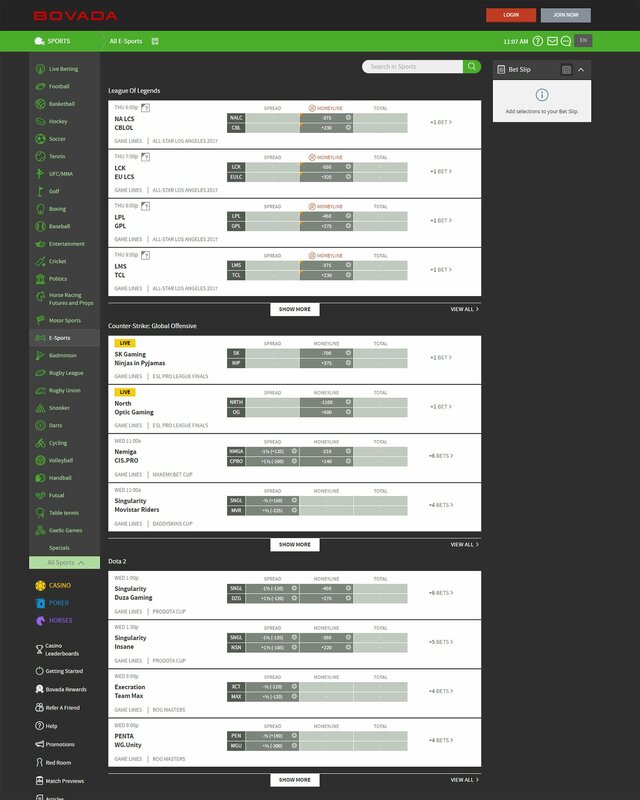 One of the challenges of Esport betting is finding the right platform in the middle of a sea of gambling sites. It is not easy to distinguish the friendly ones especially for American players who have to try their luck overseas. Regardless of where you are, it is imperative that you join a legit gambling website. The games may be enticing, there may be many promotions and banking options, but nothing will matter if the site is a scam. For this reason, we recommend Bovada eSports which we have tested ourselves and found it to be a reliable platform. You will have to agree with us after reading this review and trying it out. Like NitrogenSports.eu, Bovada is a Bitcoin site so if you don’t use the cryptocurrency, your payment options will be limited. The spunky bookie, which started in 2007, recently added eSports in the list of games players can bet on. It has therefore turned into a haven for rookies and true bettors from the US, including North America. We shall delve into how this online bookie works with the major sports, casinos, promotions, and quick money transfers. As far as the promotions go, Bovada is such an attractive bookmaker. Bovada offers a 50% welcome bonus to new players capped at $250. To get the welcome bonus, all you need is to create an account and visit the My Rewards page. Choose a bonus you would like to redeem and within 30 minutes, the amount will be added to your bankroll. In our assessment, we found out that the sportsbook has various wagering terms for the welcome bonus. A new player should roll over their deposit 5 times at the minimum using the LoL betting. You can also meet this requirement through any sports betting feature and not the live casino games. There is also a referral bonus — Refer a Friend — that is up for grabs. You earn extra dollars by referring a friend and bringing them to the site. You can do this on Twitter, Facebook, or using a direct link. As soon as your friends register and make their first deposit, a 200% bonus is added to your account which can be up to $100. Before you claim the referral bonus, you will need to make a 5X rollover. The third bonus offer is the Bitcoin deposit bonus which is simply a 50% deposit match up with a $500 cap. To claim this bonus, you need this code: BVSBITCOIN50 at the checkout. Make sure that you understand the terms and conditions of the bonuses to get up to date information and cash out restrictions. Bovada eSports has a variety of titles you can wager on. some of the bread-and-butter eSports include the League of Legends (LoL), Dota 2, Overwatch, Hearthstone, CS GO, and StarCraft 2, just to name a few. Other titles that have spurred the growth of eSports are added occasionally. For the tournament betting, bettors wager on the results of specific matches and this makes up the most popular bets offered by online bookies. However, Bovada doesn’t provide live betting on eSports at the moment but we hope that it will introduce it soon. They also offer betting on poker room, casino games, horse racing, and popular US sports including Basketball, Football, Baseball, Ice-Hockey, on all the major leagues, such as NHL, NBA, MLB, and NFL. Besides the common games, there are a lot more sports you can bet on including Soccer, Snooker, Golf, MMA, Boxing, and UFC. Visit the site to check the full variety of games. The casino section is quite strong with different game variations which are rare to find in other sportsbooks. The casino has gotten better especially due to new software providers Bovada has partnered with. At the casino, you can play popular games like Blackjack, American Roulette, Baccarat, Craps, Caribbean Stud poker, Craps, Vegas Three Card Rummy, Red Dog, Let Em Ride, Pai Gow Poker, and a many table games. To place a bet at Bovada, you must register and fund your account. From the Deposit button, choose a payment method from the limited options. Bitcoin is the main option and is free of charge. You can deposit between $20 and $1000 with Bitcoin. But you can still find another reliable method if cryptocurrency is not your thing. Through MasterCard, American Express, and Visa, you can deposit $20 to $1500 to your account without a hitch. However, you will be charged a 5.9% transaction fee on your Visa or MasterCard deposit except the first deposit is free. Popular eWallets are acceptable on the platform and they require a minimum deposit of $10 and a maximum of $1500. If you use the Rapid Transfer Deposit, you will be able to deposit at a lower fee. For deposits of $100 — $800, you are charged $10 — $20. Like in most gambling sites that accept US players, deposits and withdrawal methods at Bovada eSports are limited by a number of banking restrictions. Still, there are a good number of deposit options starting with Bitcoin and credit cards. Visa is acceptable as well. Note that withdrawals are only possible with Bitcoin and Check by courier. Cashing out with Bitcoins is extremely fast as it takes 48 hours at most while the Check may take up to 15 business days. Bovada pays its players fast and a few reviews reveal that payments hit mailboxes in a couple of weeks. I case you encounter problems withdrawing your winnings, feel free to contact the customer support team which is always ready to help. One of the features that make Bovada a good option for busy people is its mobile-friendly interface. This means you can bet while on the go. The provider realized that not so many punters spend too much time on their desktops. Thanks to the BovadaeSports mobile app, you can browse the site steadily as you wager your bets. The app has everything you need including checking of the outcomes, depositing, and withdrawing funds. Like the desktop version, this mobile interface is totally secure. The site is optimized for various mobile operating systems and screen sizes, making it easier for you to bet from a tablet or smartphone. It is supported by both Android and Apple devices. The customer care agents are excellent and they are there to help players 24 hours a day. You can reach them via live chat, email, or phone. We certainly recommend you to visit BovadaeSports. It has a quick turnover, a splendid game offering, and the unprobed areas are likely to blossom very soon. If you have just started out with online betting, Bovada should be in your bucket list of online bookies. If you are still wondering whether it is legit or not, our answer is yes. From our experience, there are no tricks and betting is very straightforward at Bovada. While it accepts American players, residents of NY, MD, NV, DE, and NJ are not allowed to play.